Non-boring ways to wear the fail-safe hues. On days when the weather cooperates (read: not boiling hot), consider layering a sleeveless longline blazer over a lightweight blouse and ankle-grazing pants. Show them who’s boss in a modern update of the classic suit. 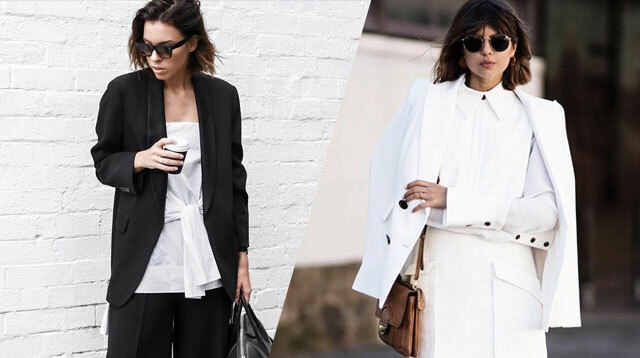 Favor an all-white palette and keep silhouettes sharp for maximum impact. We advise against arriving to the office with your top undone (save it for after-work cocktails), but a striped silk shirt and wide-legged trousers always work. Extra-long lengths have been trending for some time now. Pair exaggerated sleeves with a midi skirt and sneakers for a casual, cool take on office attire. If you can get away with them, jeans for work are comfy AF. Simply dress them up with a polished blouse and some luxurious-looking accessories. Make a curve-skimming dress appropriate for work with the addition of an oversized blazer and low pumps. A midi length that skims your calves won’t earn you a warning from HR, too. Repurpose your summer staple, the off-shoulder top, by half-tucking it into palazzo pants. So easy to put together, which means more time to sleep in. Baggy silhouettes need not look sloppy. When playing with outsized shapes, fabric and finish are very crucial. Choose quality pieces that look expensive to play the part of girl boss.